It’s not often that I come across an author who can write a great children’s book for older children and then also produce one for younger children. So I was particularly delighted to find “A Dragon’s Guide,” a new children’s book by Laurence Yep and his wife, perfect for younger readers. The title alone gives you a hint that this is all in fun. What’s not said is that in the end, we are really not sure who is the pet to whom! 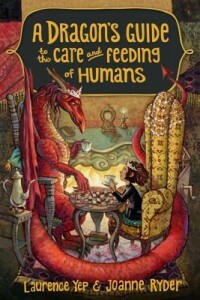 I smiled and often laughed out loud as I read this very silly fantasy book, peopled with all kinds of dragons and other magical creatures, as well as a very admirable 10-year-old girl. Some of the humor might go over the heads of young readers, but if you choose to do a read-aloud, then you can explain the jokes. I could easily see the Dragon’s Guide as a read-aloud for 7 to 9, and certainly independent reading for 9 and up. The writing has a sophisticated vocabulary, but the plot is pretty simple to follow. It has an element of the classic Book of Dragons by E. Nesbit where drawings come to life. Absolutely nothing bad or scary happens so it is safe for the most sensitive child. Even the deaths of the great-aunt and the little girl’s father are handled with care. The drama in the last scene as the dragon fights a magical is done with a very light hand. All in all, The Dragon’s Guide… a well-written and entertaining children’s book.